No disrespect to the Derngate, but that's not normally a question that would need much consideration, but for Andy Crofts it is one that he has to think hard about... and it's the Northampton venue that emerges as the winner. Just. The reason for the question is that Northampton's Crofts is gearing up for the start of a UK and European tour as part of Paul Weller's band. Weller's highly anticipated 2017 tour started on Thursday night with an intimate gig at London's 229 venue, before taking in the slightly more plush surroundings of the Albert Hall for a Teenage Cancer Trust charity gig on Friday. A trip to Bristol beckons on Saturday before Weller and his band, including Crofts, stop off at the town's Derngate Theatre on Sunday. The tour is being staged ahead of the mid-May release of former Jam and Style Council frontman Weller's new album, A Kind Revolution, and Crofts can't wait to get going - although he does admit it is a tough choice as to whether he is looking forward more to playing the Albert Hall, or the largest venue in his home town. "Actually, I think I am looking forward to the Derngate," said Crofts, now a veteran of Weller's touring and recording band, having played with him for eight years. "I am sort of doing alright for myself, I am in a band that I absolutely adore, and I am with my best mates, playing at home, with my family watching. "That is the real truth, and is probably the nicest thing you could do. "But, the Albert Hall is as cool as it gets, and I can't wait to play there either!" Sunday won't be Croft's first appearance on the Derngate stage, as he once played there many years ago with his band Circa as the support slot for a comedy show, but it's definitely the first time he's played to a sell-out crowd there. Such is the appeal of British music legend Weller, tickets for the Derngate show sold out in a matter of minutes when they went on sale in the autumn, and Crofts says the fans going along on Sunday night are in for a treat. "Paul has a new album and we have been in rehearsals, piecing all the parts together, because it has been so long that we seem to have had off," said Crofts, who last toured with Weller at the end of 2015. "You kind of have to start again, and the band is sounding amazing. "We have been rehearsing at Paul's Black Barn studios, and this week we have been in London in a big building, rehearsing. "It is all set up exactly how it will be on stage, so we can get used to the way it is laid out, and the sound." Asked about the possible setlist for Sunday's Derngate gig, Crofts said: "Paul has got a few new songs in there, but I don't think he wants to go mad on the new ones yet because the album's not out. "So there will be a few new songs in there definitely, and there are some really soulful and funky songs on the new album. But as usual there will be a mixture of old and new." There is also a new role in the band for Crofts who, after eight years as the keyboard player, is now on bass following Andy Lewis's departure. Lead guitarist and singer in his own band The Moons, Crofts will get to show another string to his bow on this tour, but it's something he will take in his stride. "I was on keys for eight years, and now I'm on bass which is a nice little mix up," said Crofts. "Paul likes to have a change around now and again as everybody knows, and I think he likes to keep things fresh. "For me going to the bass is no sweat, because I love it and I used to play bass in (his former band) The On Offs. "It's not my first instrument, but I play it and I am chuffed to be on bass, it was a nice surprise. "Because I am on the bass, I have been looking forward to the tour in a different way. I have always loved playing the keys, but playing bass is almost like a new gig. It's exciting." Crofts is not the only man who grew up in Northampton in the Weller band, with percussionist and drummer Ben Gordelier, also a member of The Moons, another one looking forward to a bit of a homecoming. "I have always wanted to play the Dergnate, so that is going to be great," said Gordelier, who first played with Weller's band following the 2012 release of the LP Sonik Kicks. "Five years ago I wouldn't have thought I would be playing there with Paul Weller, and I can't wait. "I have seen a fair few gigs at the Derngate, people like Richard Thompson, James Taylor, and also Chas N Dave, that was a good one. They were selling CDs out of a suitcase after! "So it is going to be interesting to see what it is like to play there. "My parents are going to the gig, and my sister's coming, and it is going to be nice to play at home, but you have to try and squeeze everybody in on a small guest list!" 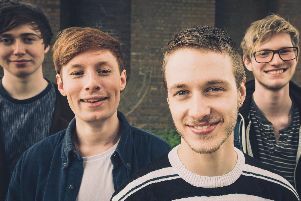 In all there are now three of Northampton band The Moons in Weller's group, with Crofts and Gordelier joined by Tom Van Heel, who is the latest recruit and takes over keyboard duties from Crofts. "It is nice, and now Andy is on bass he will be on my side of the stage, and we can have a little dance together now," joked Gordelier. "It is really good having your best mates in the same band, and I am going to really enjoy it." Van Heel is perhaps the most excited about the forthcoming tour as he is making his Weller debut, although he admits he has had his work cut out getting up to speed with learning the songs he needs to! "It is really exciting for me," said Van Heel. "Andy got me sorted for the gig I think when he got moved to bass so I gladly agreed and I have been learning loads and am really excited. "I am a fan (of Weller) anyway, so I knew most of his songs, but having to learn 40 tunes or whatever it was was quite hard! But it's all been good fun and I can't wait to get started." Sunday will be the first time that Weller has played at the Derngate, although he has previously played in Northampton, at the Roadmender in 1995, and at Delapre Abbey in the summer of 2013. A veteran of the British music scene for more than 40 years since The Jam burst on to the scene in the mid-1970s, Weller is still making new music and touring on a regular basis. A Kind Revolution, which is released on May 12, will be his 13th studio album as a solo artist, following on from six with The Jam and six more with The Style Council. He is prolific to say the least, and at 58 could be forgiven for slowing down, but Crofts says the man known as 'the Modfather' is just as enthusiastic and passionate as he has ever been. "Paul is always the most positive," said Crofts. "He loves playing live, he is always excited, he is always positive, and encouraging. "He encourages all of us, which is hard if you imagine having to keep everybody's spirits high all the time, but he does it. I think he does it by naturally making us all feel part of the band. "Obviously it is a solo thing, but it never kind of feels like that, you just feel included." The rest of Weller's live band is made up of Ocean Colour Scene's Steve Cradock on guitar, and Steve Pilgrim on drums. Bars at the Derngate open at 6.15pm on Sunday night, with the auditorium opening at 7pm.